At some point in one of their nine lives, most cats battle at least one parasite that compromises their health. Roundworm is the most common. Luckily for you and your feline friend, it’s relatively simple to prevent and cure roundworm infections. The feline digestive tract is an appealing playground for roundworms, which average 3 to 6 inches long. 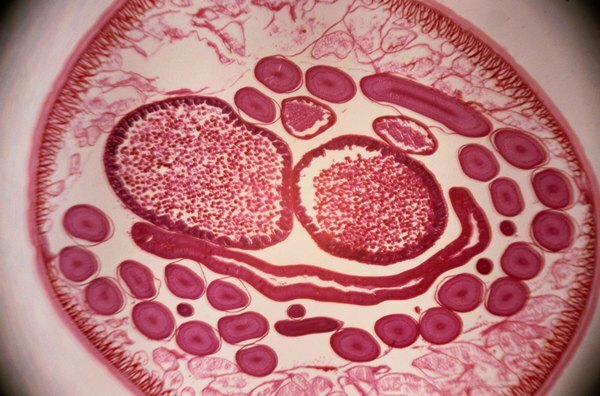 Unlike other intestinal parasites, roundworms prefer to freely roam the intestine rather than attach to the intestinal wall. The scientific name for the species specific to cats is Toxocara cati. A less common roundworm, Toxascaris leonina, can infect both dogs and cats. The treatment for both is the same, but knowing which type your cat is infected with helps determine how to best protect other pets in your household. The roundworms make themselves at home in your kitty’s intestines and take nutrients from the food she ingests. This interferes with digestion and can damage the lining of the intestines. Although cats of any age can be infected by roundworms, kittens are most susceptible, because roundworms are easily transmitted from an infected mother to her nursing litter. Cats and kittens who are no longer nursing can also become infected with roundworm by eating an infected rodent or ingesting soil or feces that contains roundworm eggs. The scientific name for a roundworm infection is ascariasis or toxocariasis. Most infections are mild, so your cat could be infected with roundworm but never show any clinical signs. Serious infections are likely to cause vomiting, diarrhea, weight loss, abdominal swelling, pale gums, lethargy and loss of appetite, abnormal feces, or a dull coat. Sometimes you can see roundworms in the vomit or feces of an infected cat. If you suspect that your feline friend might be infected, inspect her stool for signs of spaghetti-looking creepy crawlers. A clean and feces-free environment can help prevent roundworms, and it's just as important as treating an existing infection. Make a conscious, daily effort to remove feces from outside yard space, clean litter boxes, and practice proper hygiene. Treatment of an existing roundworm infection is simply a matter of choosing a deworming product. Over-the-counter and prescription products for treating roundworms are readily available and effective. However, keep in mind that roundworm treatments do not directly kill roundworms. Treatments sedate or stun the worms so that they can be passed through the intestines with the stool into the outside environment, where they are unable to survive. When treating your feline friend for roundworms, brace yourself for the likelihood that you will see the parasites as they are expelled with her stool, and some of them might be moving when they come out. Certain heartworm and flea-control medications also protect cats from roundworms. Some treatments require more than one round of deworming to be effective. Ask your veterinarian whether you'd need to follow up with additional dewormings. Do Cats Have 3 Toes or 4? Do Cats Have Depth Perception?